Disability Mentoring Day (DMD) is an international event held on the third Wednesday of October, which is National Disability Employment Awareness Month. DMD’s focus is promoting career exploration for students and making employers aware of available qualified candidates. Students went to work sites for about 2 hours in the morning before returning to McEvoy for lunch, energizing activities and a presentation from guest speaker Geoff “Deaf Geoff” Herbert from Syracuse.com. Geoff spoke about not letting his hearing impairment stop him from becoming a radio DJ, freelance DJ and entertainment reporter for Syracuse.com. 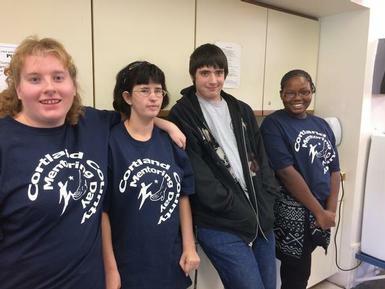 Four OCM BOCES students participated in DMD in Cortland County. Chris Elliott (LaFayette) welded for the first time at SuitKote. Jessey Cross (Tully) and Bridgette Lewis (Cortland) helped out in preschool classrooms at the YMCA and YWCA in Cortland. Jaylena Manning (Cortland) shadowed at Lavish Salon and the OCM BOCES Cosmetology classroom. The students reported having a great day. Sponsors Access to Independence, Triad Foundation, ACCES-VR and Cortland Works partnered with Cortland City Schools, Homer Central Schools, OCM BOCES and 24 local businesses to make this day possible for approximately 40 students.